George Lotti is a board member and the secretary/treasurer of Unconditional Love Animal Rescue. 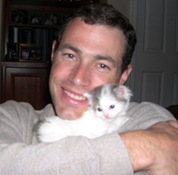 CFO by day and cat snuggler by night, George brings a wealth of financial expertise and a huge heart to our organization. George's biggest message to all those people who ask about his blue pawprint bracelet? "SPAY/NEUTER YOUR PETS!! FOR EVERY PERSON BORN TODAY, THERE ARE SEVEN ANIMALS WAITING FOR A HOME!!" George is the proud dad of six cats, one large dog and a bunny! Lisa Lotti is a middle school teacher and the director and an original co-founder of Unconditional Love Rescue. Unconditional Love Rescue was founded by friends Lisa and Tracy Powers, who rescued Bob the Cat on a cold January evening. The girls were hooked, and Unconditional Love Rescue was born. Lisa has co-directed/directed Unconditional Love for ten and a half years. Over 1300 animals have been rescued by UL since its inception--many with severe medical issues that needed extensive vet care. Lisa takes pride in the fact that the organization has never euthanized an animal because of behavior or money. If the cost to treat an animal is exhorbitant, the money can and will be found. If an animal is difficult, he or she will be worked with until adoptable. Lisa's mantra is, "If we do the right thing, all will work out." So far, so good! It’s an objection that every animal rescue volunteer hears over and over. And we understand why. Loving and then letting go of an animal can be painful. And yet we also know that thousands of companion animals are abandoned each year, most due to no fault of their own. Rescue groups like Unconditional Love, and shelters can save only a fraction of the homeless animals — the more people willing to foster, the more animals will have a chance at life. When you foster an animal and give it a temporary home, you give that animal a permanent gift, a second chance at life and love! to a cat or dog that someone can’t live without, is an amazing experience and knowing that you had a hand in that is incredibly inspiring and heartwarming. When you see the smiles on the face of their new families it makes it all worthwhile! Laura has been an animal advocate basically since birth. 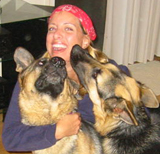 She has extensive experience in the animal rescue world and has been involved with such reputable organizations as In Defense of Animals and Nike Animal Rescue Foundation. Laura has also spent a great deal of her career in the non-profit sector. She is an expert in organizational development and marketing. We are so fortunate to have her on our team!! 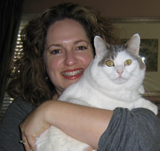 Laura and her husband, James, are also parents of two Unconditional Love kitties, Losang and Deva! 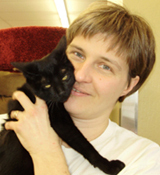 Susan and our director, Lisa, met when Susan took on the challenge of managing a local veterinary hospital. Immediately, there was a connection!! Highly energetic and determined to succeed at EVERYTHING she tries, Susan was an ideal choice for a board member for our organization. 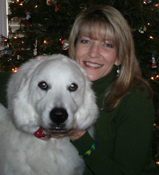 She is devoted to the cause of animal rescue and a passionate advocate for our organization. She and her husband, Jay, are wonderful parents to two German Shepherds (Ally and Charlie--Charlie was adopted from Unconditional Love) and to a spectacularly gorgeous little girl, Rebekah!